Tuesday 16th September 2014 – 12.30pm – Jamie Arrowsmith. A man had to be rescued from a pond in Worcestershire this morning after falling from a ladder that was propped up against a tree, whilst trying to rescue a cat. West Midlands Ambulance Service was called to the incident in Moseley Road, Hallow, at 8.15am and sent an ambulance, a paramedic area support officer and the Trust’s Hazardous Area Response Team to the scene. The crew of the Midlands Air Ambulance based in Strensham also attended the scene by blue-light car. A West Midlands Ambulance Service spokesman said: “On arrival, crews discovered a 34-year-old man who was half in and half out of a pond. “Crews were told he had fallen approximately six-metres from a ladder that was propped up against a tree whilst attempting to rescue a cat. “Due to the difficult location of the patient, crews worked closely with the fire service to access the patient and administer pain relief for back pain. “He was immobilised with the use of a floating spinal board before being put on a mini raft which allowed him to be walked to dry land. The man was in the water for approximately 30 minutes. Tuesday 16th September 2014 – 11.20am – Jamie Arrowsmith. 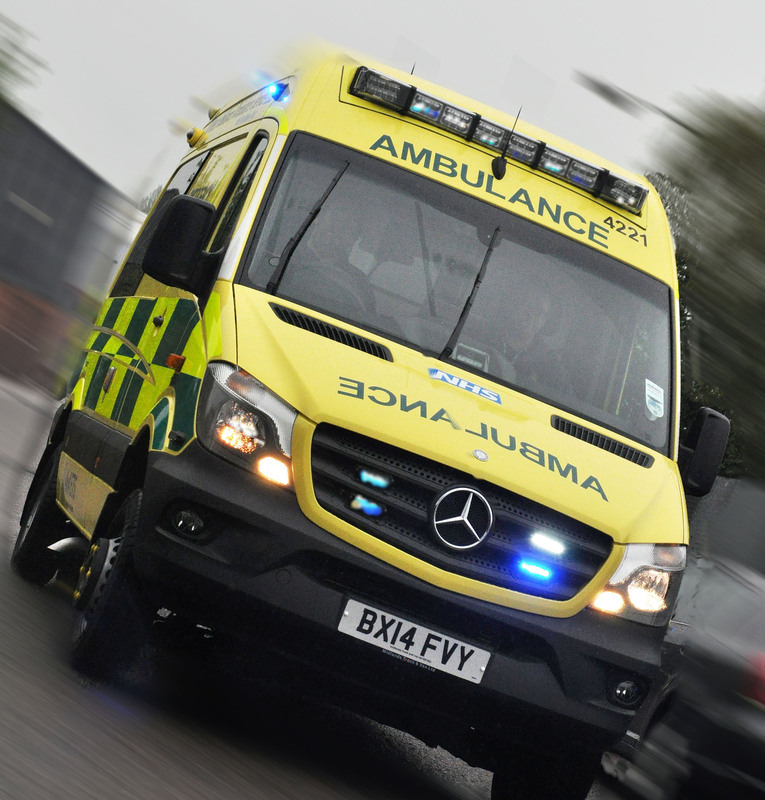 A biker has suffered a serious head injury after he was thrown approximately 20ft from his vehicle following a collision with a lorry in Dudley this morning. West Midlands Ambulance Service was called to the incident on the junction of Stourbridge Road and Wellington Road at 7.20am and sent an ambulance and a paramedic area support officer to the scene. The crew of the Midlands Air Ambulance based in Cosford, which included a BASICS doctor, also attended by blue-light car. A West Midlands Ambulance Service spokesman said: “Crews arrived to find the patient, a man believed to be 40-years-old, lying on the ground approximately 20ft away from his three-wheeled motorbike. “Crews were told that the man had been thrown from his motorbike following a collision with a lorry. “It quickly became apparent that the man had suffered a significant head injury in the incident as well as a suspected fractured pelvis. “Due to the serious nature of his injuries, the doctor gave him an anaesthetic at scene before he was transported to Queen Elizabeth Hospital, Birmingham. The doctor travelled with the patient to continue emergency medical treatment en-route. “Unfortunately, the man’s injuries were considered extremely serious. This morning was quite a special day for us in the press office. We smashed through the 1,000,000 mark in views on our WordPress site. When you click on the links on Facebook, Twitter or our website, you end up on our WordPress site. 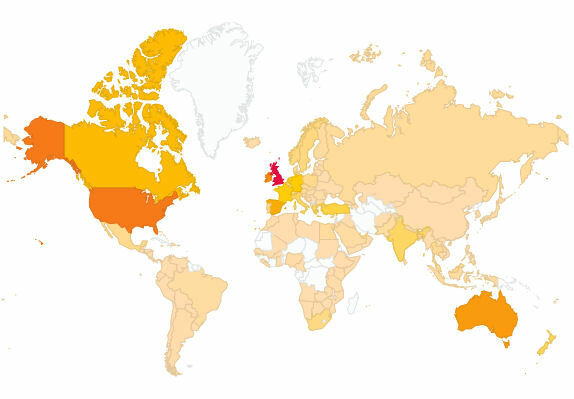 Although the vast majority of views come from people in the UK, we have now reached no fewer than 163 different countries. The USA, Ireland, Australia, Spain and Canada are the next most popular countries, but the list also includes everywhere from Aruba in the Caribbean to Zambia passing through the likes of Kyrgyzstan, the Marshall islands in the Pacific and Reunion, which is apparently it’s 1,000 miles off the east coast of Africa! A massive ‘thank you’ to everyone who has taken the time to look at the site; we think it’s worth telling you about the extraordinary work that our staff do, often in the most difficult of circumstances, and sharing their stories, messages, information and campaigns. Here’s to the next million! Want to improve your clinical skills and join an award winning organisation? Are you an emergency medical technician looking for paramedic development? If so, West Midlands Ambulance Service wants to hear from you. We’re looking to recruit experienced IHCD emergency medical technicians who want to take their clinical skills to the next level and become a paramedic. You must be committed to completing a university based course within two years of joining us. However, we will support you fully throughout the course. Assessments for the role are planned to take place on Saturday 25th and Monday 27th October, with an employment start date expected to be in early January 2015. There are vacancies available across the region. This vacancy is aimed at technicians working outside of the West Midlands as we want to further increase our skilled workforce. Tuesday 16th September 2014 – 10.25am – Jamie Arrowsmith. A man who was rescued from a flat fire earlier this morning received advanced pre-hospital treatment by ambulance staff before being taken to one of the region’s major trauma centres in a critical condition. The incident took place in Church Road, Moseley, shortly after 7.10am and West Midlands Ambulance Service sent two ambulances, a paramedic area support officer and a paramedic in a rapid response vehicle to the scene. A West Midlands Ambulance Service spokesman said: “Shortly after crews arrived on scene, the fire service rescued a man, believed to be 64-years-old, from a flat that had suffered smoke damage. Tuesday 16th September 2014 – 7.05am – Murray MacGregor. A workman was trapped for over an hour after a collision between an HGV and a flatbed van on the northbound M6 motorway. The crash happened just before 5.00am on Tuesday morning underneath Junction 2 at Coventry. “The most seriously injured patient was a 52 year old man who was the front seat passenger in the van. The vehicle had suffered serious intrusion from the collision leaving him trapped by his legs by the dashboard. Monday 15th September 2014 – 11.00pm – Murray MacGregor. A woman has suffered multiple breaks to her arms after an accident involving farm machinery in Herefordshire. An ambulance, a paramedic officer, a BASICS Emergency Doctor and the Midlands Air Ambulance from Strensham were sent to the scene after a 999 call at about 4.20pm on Monday afternoon. A West Midlands Ambulance Service spokesman said: “On arrival at the farm, ambulance staff found a woman who had suffered crush injuries to both her arms. “The woman, believed to be in her 20s, had suffered multiple breaks after getting caught in the potato machine. She was pulled free by other workers. “Ambulance staff gave her pain relief before her arms were splinted and she was immobilised on a scoop stretcher. Monday 15th September 2014 – 3.00pm – Suzie Wheaton. 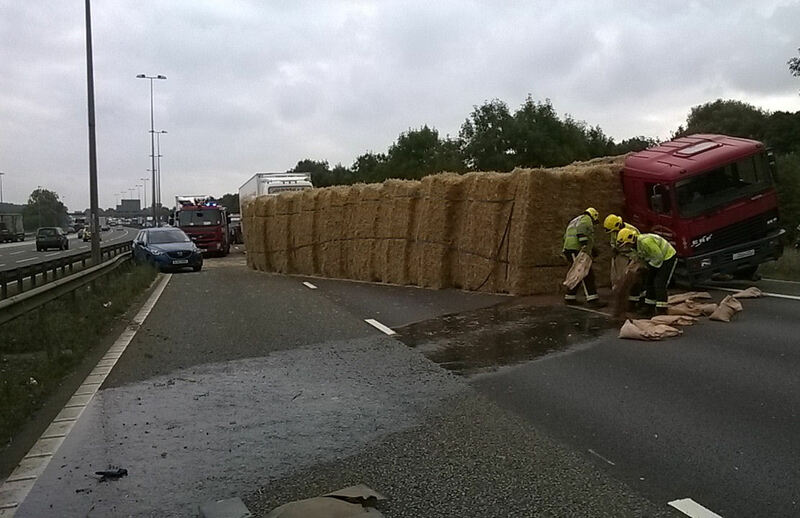 Three people have been treated by ambulance crews after a lorry carrying hay bales and a car collided on the M6 this afternoon. West Midlands Ambulance Service dispatched two ambulances and a senior paramedic ambulance officer to the scene of the collision which took place on the northbound carriageway of the M6 between junctions 3 and 3a shortly before 1.15pm. A West Midlands Ambulance Service spokeswoman said: “Crews found a lorry and a car that had been in collision. 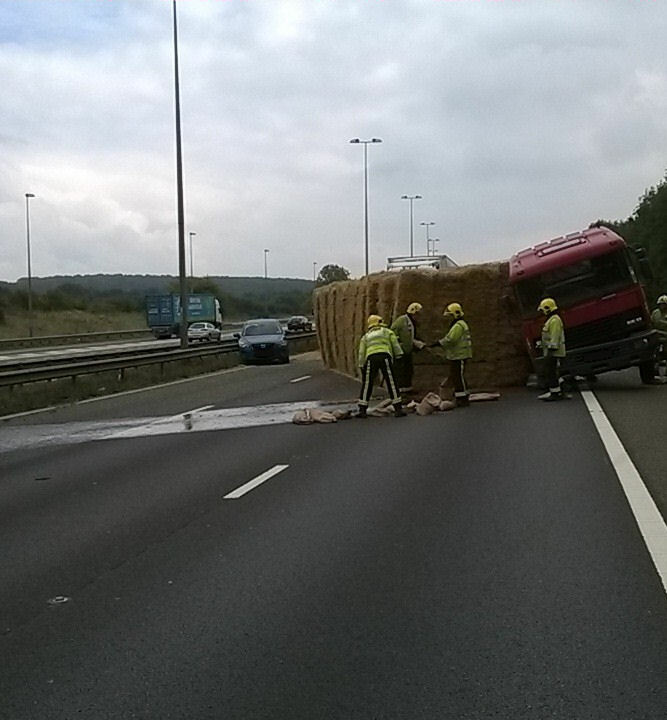 The lorry, that had been carrying hay bales, had overturned blocking three lanes of the carriageway. “Fortunately following assessment by ambulance crews both the lorry driver, a man in his 60’s, and the car driver, a woman in her 40’s, were found to be uninjured. Monday 15th September 2014 – 12.50pm – Suzie Wheaton. Emergency services rushed to the scene of a road traffic collision in Warwickshire this morning which left two cars with significant damage. West Midlands Ambulance Service sent three ambulances and a paramedic area support officer to the incident which took place on Alcester Road in Little Alne Wootton Wawen, Henley in Arden at approximately 8.40am this morning. A West Midlands Ambulance Service spokeswoman said: “Crews arrived to find two cars that had sustained significant damage in a collision. “Fortunately, all of the occupants from both of the vehicles were out on the ambulance crew’s arrival. 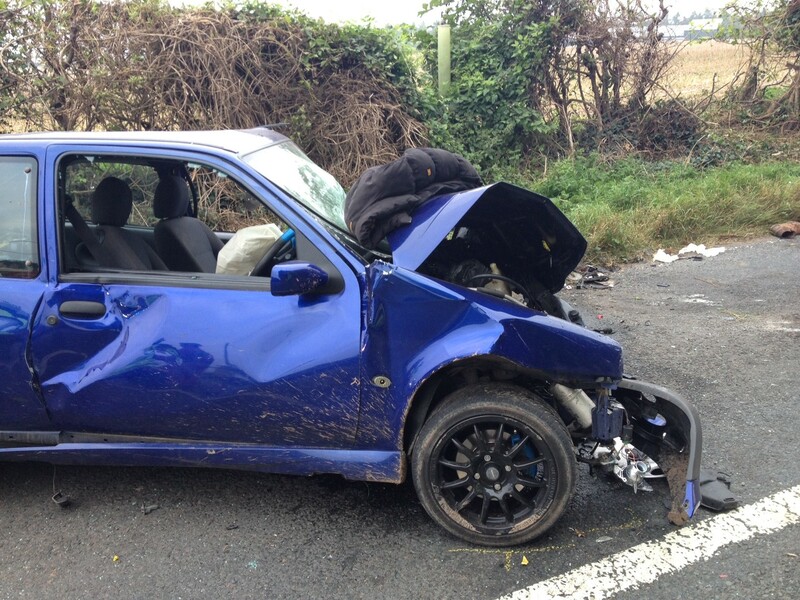 “One car (Corsa) had been carrying three occupants at the time of the collision. 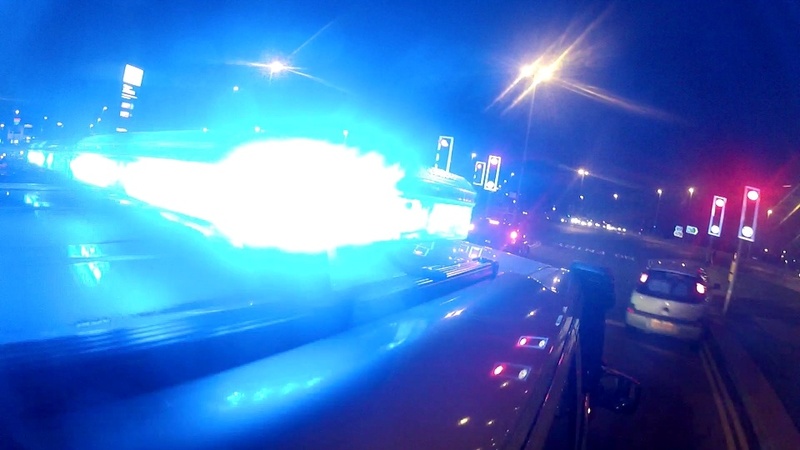 The driver, a man believed to be approximately 18 years of age was treated for facial injuries before being conveyed to University Hospital of Coventry and Warwickshire for specialist treatment. “The two other occupants, both men of a similar age, were assessed and discharged at the scene. Pictured: The scene of the incident – If used pictures should be credited to West Midlands Ambulance Service. Click on the link below to watch Jeff’s Story..
Do you know how to do CPR? View the video below for a step by step guide. Monday 15th September 2014 – 10.30am – Suzie Wheaton. 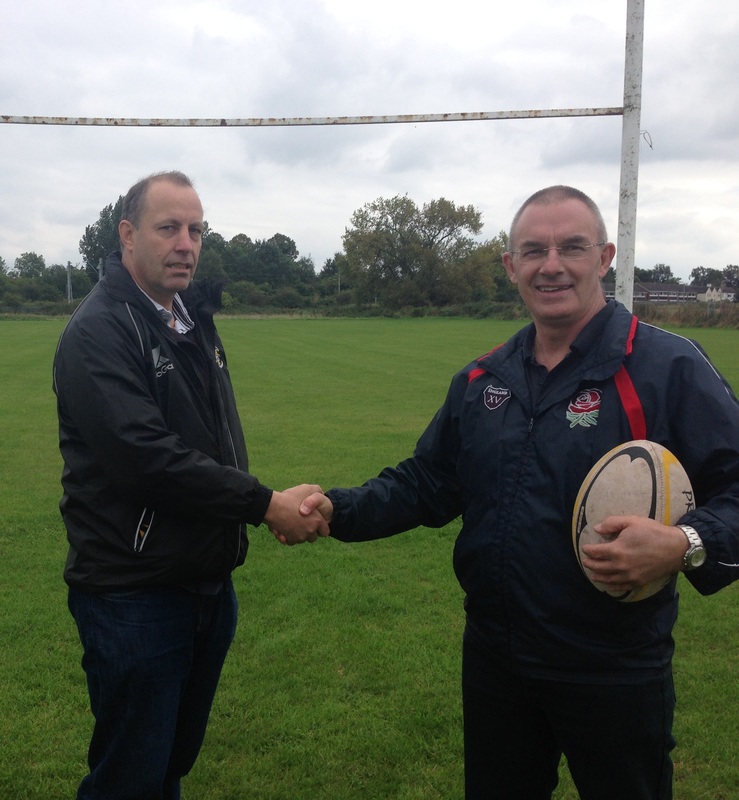 A rugby coach from Staffordshire who suffered a cardiac arrest on the pitch is urging everyone to give CPR a ‘try’ after his friends saved his life. It is estimated that approximately 30,000 people each year have a cardiac arrest outside of hospital, with almost 4,000 of those taking place in our region. Currently only one in three of these people will receive CPR from a bystander, prior to the arrival of ambulance crews. Rugby coach, Jeff Ford, knows only too well how incredibly important bystander CPR is after suffering a cardiac arrest whilst training two years ago. Jeff, who was 58 at the time of the incident, said: “I had no history of serious heart illnesses and no serious injuries; I’d been a very, very lucky person. I’ve played rugby for over 40 years; starting as a player at 18, I was then a referee for 20 years before taking up coaching. Jeff had suffered a significant cardiac arrest and thankfully had been revived by his team mates who immediately carried out CPR and then used a defibrillator. Friend, Dave Palmer said: “We looked around and Jeff was lying there on the ground, unconscious and twitching. We quickly realised he wasn’t breathing and myself and friend, John Freeman, started CPR. Another member of the team called 999, whilst two others ran to get the defibrillator, which had only been installed six week previously. “We carried on with CPR and then applied the defibrillator. The defibrillator talked us through what to do step by step, where to put the pads, when to stand clear and when it was the right time to deliver the shock. Jeff added; “I’d like to thank everyone who was involved, without them I wouldn’t be here. I have a ten-year-old daughter, a wife, a family, without their help I would’ve been in a pine box. West Midlands Ambulance Service’s Head of Clinical Practice, Matt Ward, explains why early chest compression is so important: “When a cardiac arrest occurs the heart stops beating effectively. Whilst the heart is not beating toxins build up in the body and brain. You have approximately 8-10 minutes before this brain damage become irreversible. “Approximately 7% of people who suffer a cardiac arrest survive. By providing CPR immediately this number can be significantly improved but we can only do this with help from the public. For more information about cardiac arrests and CPR please view our film footage above. This can also be found on facebook, twitter and youtube – please search for ‘officialwmas’. Monday 15th September 2014 – 8am – Jamie Arrowsmith. 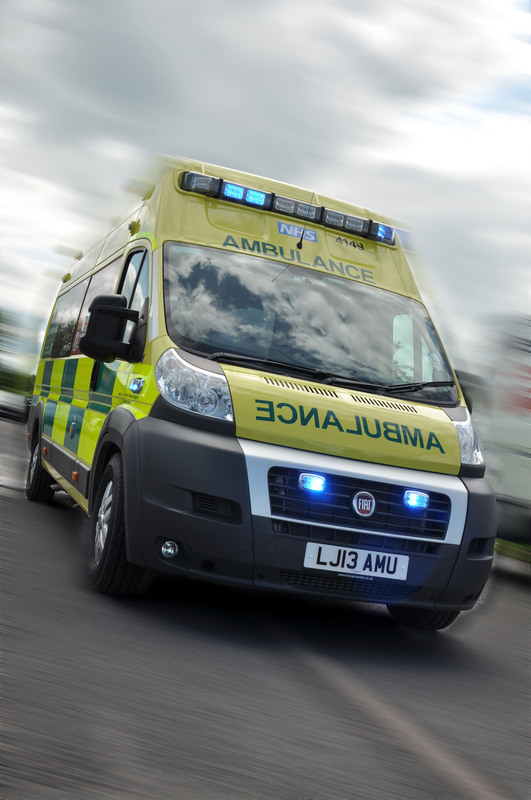 A van driver received emergency medical treatment from ambulance crews after suffering a severe head injury when her vehicle collided with a wall in Stoke this morning. West Midlands Ambulance Service was called to Draycott Lane in Tean, just after 5.30am and sent an ambulance, a paramedic in a rapid response vehicle, a paramedic area support officer and two BASICS doctors to the scene. A West Midlands Ambulance Service spokesman said: “Crews arrived on scene to find a van that had left the road and been in significant collision with a wall. “The driver of the van, a woman believed to be 42-years-old, was still inside the vehicle when crews arrived. “It quickly became apparent that she had suffered a significant head injury in the collision. Due to the serious nature of her condition, one of the doctors gave the patient an anaesthetic at the scene. Monday 15th September 2014 – 6.30am – Jamie Arrowsmith. A man was trapped for an hour when his car became wedged between some trees following a road traffic collision in Telford in the early hours of this morning. The incident occurred on the A442, near to Sutton Hill, shortly before 1am and West Midlands Ambulance Service sent an ambulance, a paramedic in a rapid response vehicle and a paramedic area support officer to the scene. The police and fire services were also in attendance. A West Midlands Ambulance Service spokesman said: “Crews arrived to find a car that had left the road and been in a significant collision with some trees. “A man, believed to be in his 20s was trapped in the car which had suffered considerable side and front end damage when becoming wedged between some trees. “He received emergency treatment for neck and back injuries at the scene whilst being freed by medics with the assistance of the fire service. It took an hour to free him due to the difficult location of where his car came to rest. Sunday 14th September 2014 – 10.30am – John Hawker. A woman was trapped in a car following an RTC in Worcestershire in the early hours of this morning. The incident occurred on Main Street, Pinvin at around 3.15am. An ambulance, a rapid response vehicle, a paramedic officer and the Trusts MERIT Team attended the scene. A West Midlands Ambulance Service spokesman said: “Crews arrived to find a car that had left the road and been in a significant collision with a lamppost. “A woman, believed to be in her 30’s was trapped in the car and had suffered chest injuries and a laceration to her head. “The woman received emergency treatment at the scene whilst being extricated by medics with the assistance of the fire service. She was trapped for around one hour. Saturday 13th September 2014 – 5.00pm – John Hawker. A pedestrian has been seriously injured following an RTC in Rugby this lunchtime. 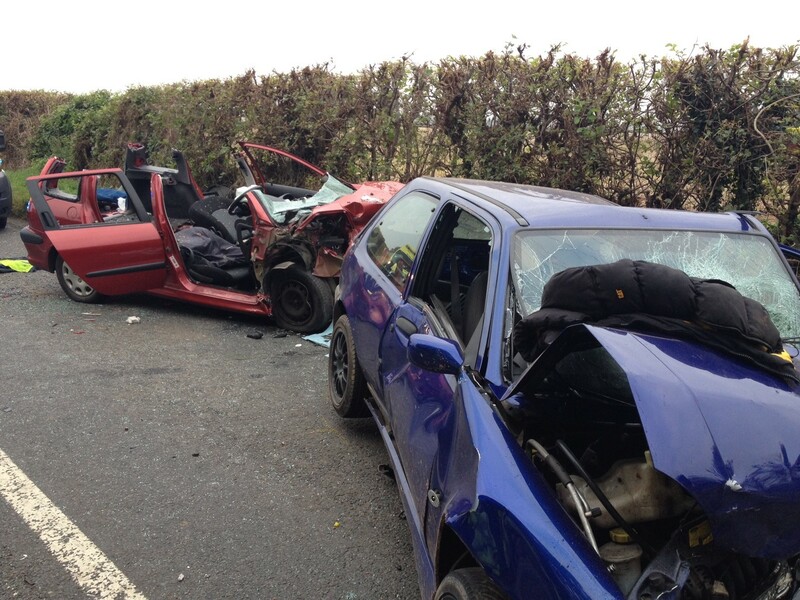 The crash occurred on Hillmorton Road, Hillmorton at around 12.05pm. Two ambulances, a rapid response vehicle, a paramedic officer and the Midlands Air Ambulance from Cosford attended the scene. A West Midlands Ambulance Service spokesman said: “Crews arrived to find a pedestrian and a bus that had been in a collision. “The pedestrian, a man believed to be in his 70’s, suffered serious head and neck injuries. “He received emergency treatment and due to his serious injuries was anaesthetised at the scene. Saturday 13th September 2014 – 9.45am – John Hawker. A man who is believed to have been pushing a broken down car on the A38 in Burton has been seriously injured following an RTC last night. The incident occurred on the A38 where it passes over Horninglow Road, Burton at around 10.35pm. Two ambulances, a paramedic officer and a BASICS Doctor attended the scene. A West Midlands Ambulance Service spokesman said: “Crews arrived to find two vehicles that had been in a serious collision. One vehicle was believed to have been broken down and being pushed at the time of the crash. “The man, believed to be in his 20’s, and pushing the car suffered serious head, pelvis and abdominal injuries. The man received emergency treatment at the scene by medics and was transferred by ambulance to Queen Elizabeth Hospital Major Trauma Unit for further emergency treatment. Unfortunately, the man’s injuries were considered life threatening. Saturday 13th September 2014 – 9.20am – John Hawker. 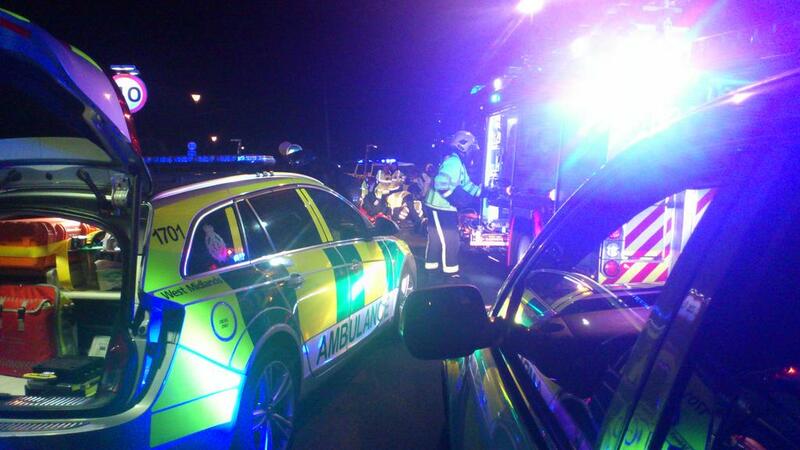 Two men have been injured, one seriously following an RTC in Worcestershire last night. The incident occurred on Worcester Road, towards Holt Heath at around 10.35pm. Two ambulances, a paramedic officer and the Trusts MERIT team attended the scene. A West Midlands Ambulance Service spokesman said: “Crews arrived to find two cars that had been in a serious collision. “The man driving one car, believed to be in his 70’s, suffered serious chest, abdominal, leg and arm injuries. He received emergency treatment at the scene by medics and he was transferred by ambulance to Queen Elizabeth Hospital major trauma unit for further emergency treatment. The Doctor travelled on board the ambulance continuing treatment en-route to hospital. Saturday 13th September 2014 – 9.00am – John Hawker. 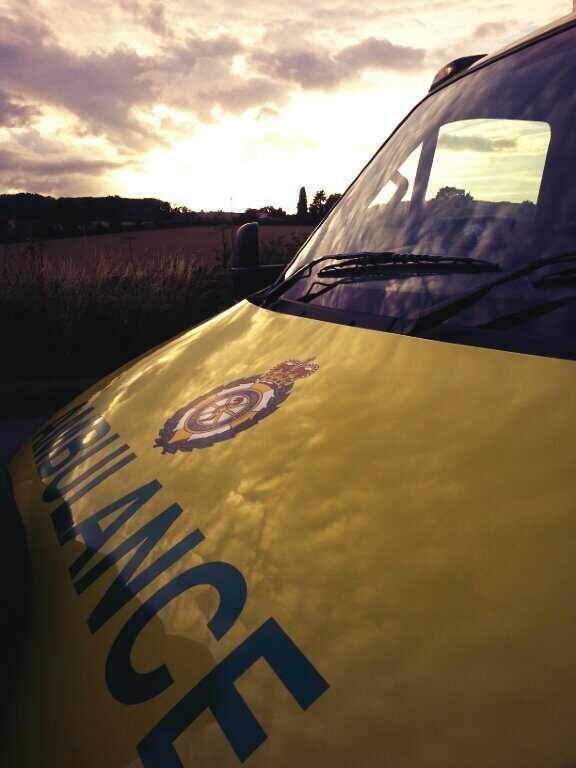 A man has died following an RTC in Stoke on Trent early yesterday evening. The crash occurred on Linley Road, Talke at around 5.05pm. An ambulance, a rapid response vehicle and a paramedic officer attended the scene. A West Midlands Ambulance Service spokesman said: “Crews arrived to find a motorcycle that had been in a serious crash. Friday 12th September 2014 – 5.00pm – John Hawker. When someone suffers a cardiac arrest or a stroke, it is the job of the ambulance service to get to that patient fast and for our highly trained staff to provide lifesaving treatment as soon as possible. These are the life threatening and life changing calls that the 999 service is here for, to try to save someone’s life and give them the best possible chance of making a good, if not full recovery. However, often it’s the actions of friends, family members and even strangers of these unfortunate people that can make all the difference when it comes to a good outcome. Everyday around the West Midlands Region, on average 10 people suffer a cardiac arrest a day, and on average we are called to someone who is suspected of having suffered a stroke every 20 minutes (average 70 a day). Next week we will be bringing you the stories of two patients who suffered a cardiac arrest and a stroke. We will also give advice from our clinical team of what the best course of action is and show how friends or even a strangers actions can change someone’s life forever. The stories of Jeff, a cardiac arrest victim and Brin, a stroke victim, should give a different perspective of what happens around the West Midlands on a day-to-day basis and prove why it is imperative that 999 calls are only for life threatening and serious injuries. We’ll be out and about at various events over the weekend, so why not come and say hello? On Saturday we’ll have members of staff in West Bromwich Town Centre at an Engagement Event in conjunction with Wolverhampton University. This takes place between 10am and 4pm. We’ll also be at Sutton Coldfield Fire Station, Lichfield Road, between 11am and 4pm, joining forces with the Police and Fire Services at an Open Day. Then on Sunday we’ll be heading to Shropshire Police’s Open Day at Shrewsbury Police Station in Clive Road. The event runs from 11am until 3pm. Friday 12th September 2014 – 11.15am – Jamie Arrowsmith. One man was left hanging out of his car window and a second had to be cut free from his vehicle following a significant two-car road traffic collision in Herefordshire this morning. West Midlands Ambulance Service was called to the A449 in Ross-on-Wye just after 6.30am and sent three ambulances, a paramedic in a rapid response vehicle, a paramedic area support officer, a BASICS doctor and the Midlands Air Ambulance from Cosford to the scene. A West Midlands Ambulance Service spokesman said: “On arrival, crews discovered two cars that had been in significant collision, both of which had sustained substantial damage. “The impact of the collision left the driver of one of the vehicles, a 19-year-old man, hanging out of the car window. “He was assisted out of his vehicle before ambulance staff treated him for leg and ankle fractures. He was immobilised and given pain relief before being taken to Hereford County Hospital by land ambulance. 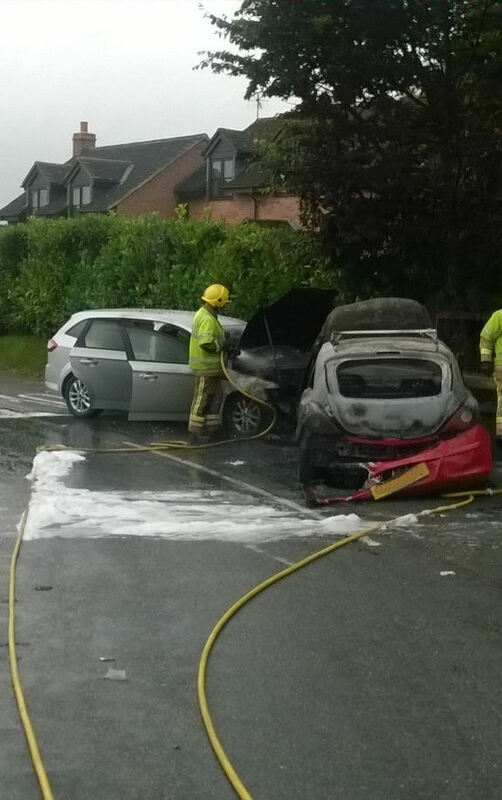 “The driver of the second car was left trapped in his vehicle by the collision and ambulance crews worked closely with the fire service to carefully cut him free. If used, please credit pictures to West Midlands Ambulance Service. Thursday 11th September 2014 – 2.15pm – Claire Brown. 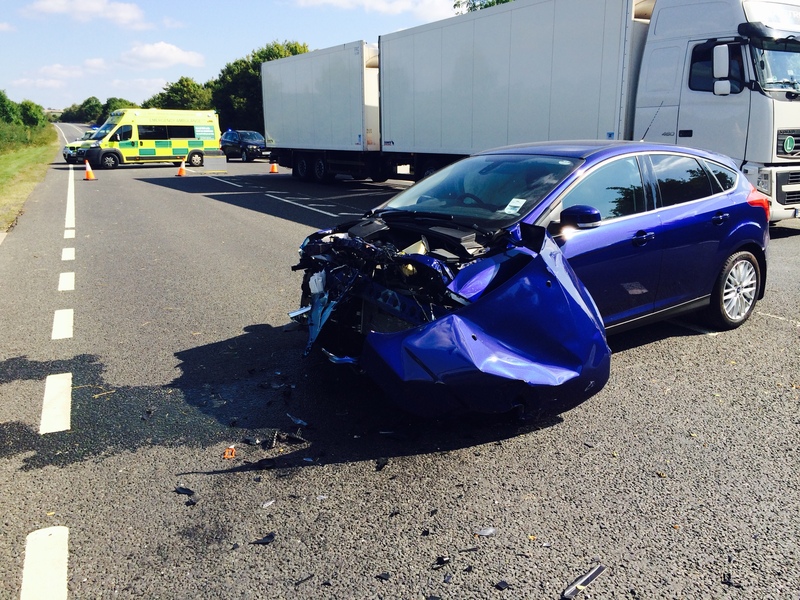 A man has sustained a suspected facial fracture following a collision with a car in Evesham. West Midlands Ambulance Service was called to the A46 in Evesham near Broadway Road shortly after 10.00am this morning (Thursday). A responder paramedic and the Midlands Air Ambulance from Strensham air base attended the scene. A West Midlands Ambulance Service spokeswoman said: “Ambulance staff arrived to find a pedestrian, a 23 year old man, who had been in collision with a car on the dual carriageway. Thursday 11th September 2014 – 12.30pm – Steve Parry. 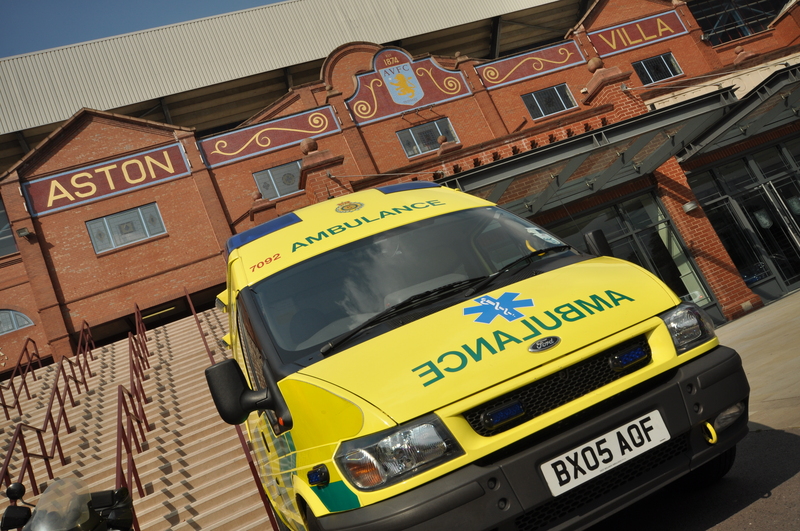 Nearly 500 delegates from across the UK arrived in Birmingham to attend the third National Ambulance Clinical and Patient Safety Conference held at Villa Park on Wednesday 10th September. The event was opened with a keynote address by WMAS Chief Executive and Chairman of AACE, Anthony Marsh. Delegates then heard from over thirty top speakers including Professor Andy Newton, Chair of the College of Paramedics and Dr Nick Toff, from the Clinical Human Factors group. A range of master classes were also held including topics as varied as female genital mutilation, obstetrics, mental health, burns treatment and sepsis recognition. Another popular session included: “Liquid to Air, The Change at Birth” with Dr Lee Abbott and contributions were well received from Professor Tom Quinn, Professor Sir Keith Porter, Dr Tim Kilner and Sarah Noble. Thursday 11th September 2014 – 11.50am – Chris Kowalik. A volunteer lifesaver from Worcestershire is set to jump out of a perfectly good aeroplane at about 15,000 feet. Whilst this may not seem like a very logical thing to do, for Community First Responder Ian Woodhall, it is a way of celebrating losing a significant amount of weight. Ian will make the solo jump at Tilstock airfield in North Shropshire on Saturday, 13th September after spending the day there training for it. Ian, 53 from Stourport, is a member of Kidderminster Community First Responder scheme covering the Wyre Forest and surrounding villages. They are all volunteers trained by West Midlands Ambulance Service in assessments and basic lifesaving techniques including the use of a defibrillator. They could be called upon by the ambulance service’s control room to attend a medical emergency while a blue-light emergency vehicle is en-route. 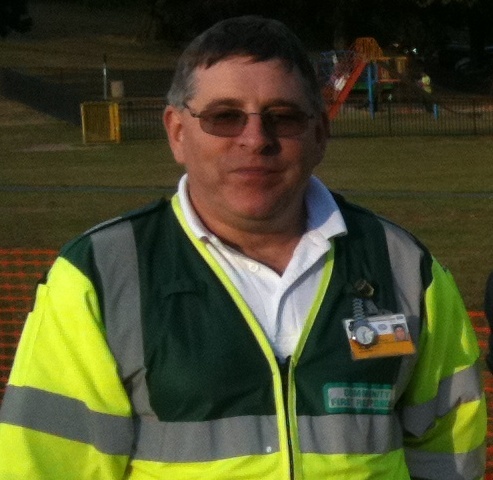 Ian’s parachute jump will fundraise for the Kidderminster CFR scheme. Thursday 11th September 2014 – 8.00am – John Hawker. A man has died following an RTC in North Staffordshire last night. The crash occurred on Dial Lane, just south of Congelton, around 8.20pm. An ambulance, a community first responder, a rapid response vehicle, a paramedic officer and a BASICS Doctor attended the scene. Two ambulance vehicles from North West Ambulance Service also attended. A West Midlands Ambulance Service spokesman said: “Crews arrived to find a motorcycle that had been in a serious collision with a large agricultural vehicle. “The man riding the motorcycle was in traumatic cardiac arrest and advanced life support was carried out at the scene. Wednesday 10th September 2014 – 4.30pm – Suzie Wheaton. A man has been airlifted to a major trauma centre after a concrete slab fell on top of him crushing his leg. 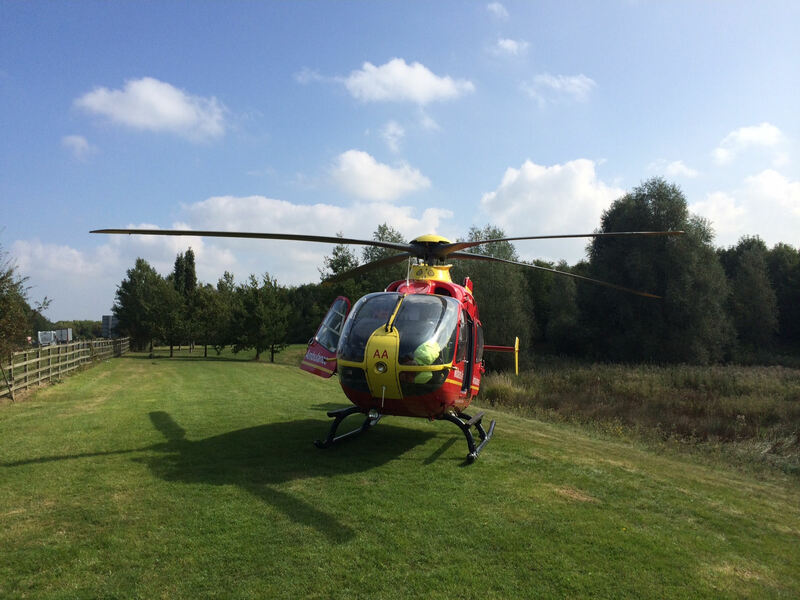 An ambulance, a community first responder and the Midlands Air Ambulance from Staffordshire were sent to the incident which took place at a private property near to Ashley in Market Drayton at approximately 12.30pm this afternoon. A West Midlands Ambulance Service spokeswoman said: “Crews were called to reports of a man who had become injured after a concrete building slab had fallen on to him. “On arrival at the scene, the concrete slab which was approximately 10 feet x 3 feet, had been removed from the man. Ambulance crews treated the casualty believed to be in his 50’s for a serious leg injury. He was given pain relief and his leg was fully immobilised before he was airlifted to the major trauma centre at University Hospital of North Staffordshire. Tuesday 9th September 2014 – 9.00pm – John Hawker. 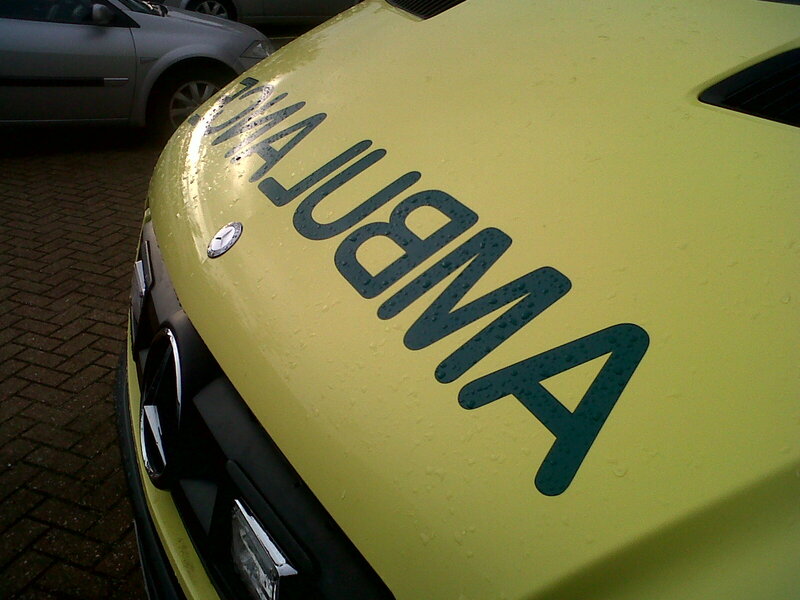 A man has been treated for serious injuries by paramedics following an RTC in Coventry this afternoon. The incident occurred on Brinklow Road, Binley at around 4pm. Four ambulances, a rapid response vehicle and a paramedic officer attended the scene. A West Midlands Ambulance Service spokesman said: “Crews arrived to find three cars that had been in a serious collision. “The man driving one car suffered serious head, chest and abdominal injuries. The man, believed to be in his 60’s, received emergency treatment at the scene by ambulance crews and he was transferred by ambulance to University Hospital Coventry and Warwickshire for further emergency treatment. “A woman and her young daughter, travelling in the second car both received treatment at the scene for minor injuries and were transferred to the same hospital by ambulance. A man has been given a suspended prison sentence for assaulting two paramedics in Birmingham. James Precelton, 31, from Edgbaston, was sentenced on Friday to four months in prison, suspended for 24 months, and ordered to pay £250 in compensation and an £80 victim surcharge. The incident took place when West Midlands Ambulance Service was called to Bartholomew Street in Birmingham on July 2nd. As well as assaulting two paramedics, Mr Precelton also damaged an ambulance. Reflecting on the incident, one of the paramedics who attended the call, Mike Duggan, said: “It is extremely disappointing to suffer physical abuse when we are trying to help members of the public with medical emergencies. Steve Elliker, West Midlands Ambulance Service’s Regional Head of Security and Safety said: “The Trust welcomes the sentence that has been passed on this occasion. It is completely unacceptable that ambulance staff, who are responding to help people who have serious medical conditions or injuries, should have to face violence and verbal abuse. Tuesday 9th September 2014 – 12.55pm – Murray MacGregor. “A strong platform to move forward from.” That will be the summary of 2013-14 that Trust Chief Executive Anthony Marsh will give when he addresses the Trust’s Annual General Meeting of the Council of Governors. 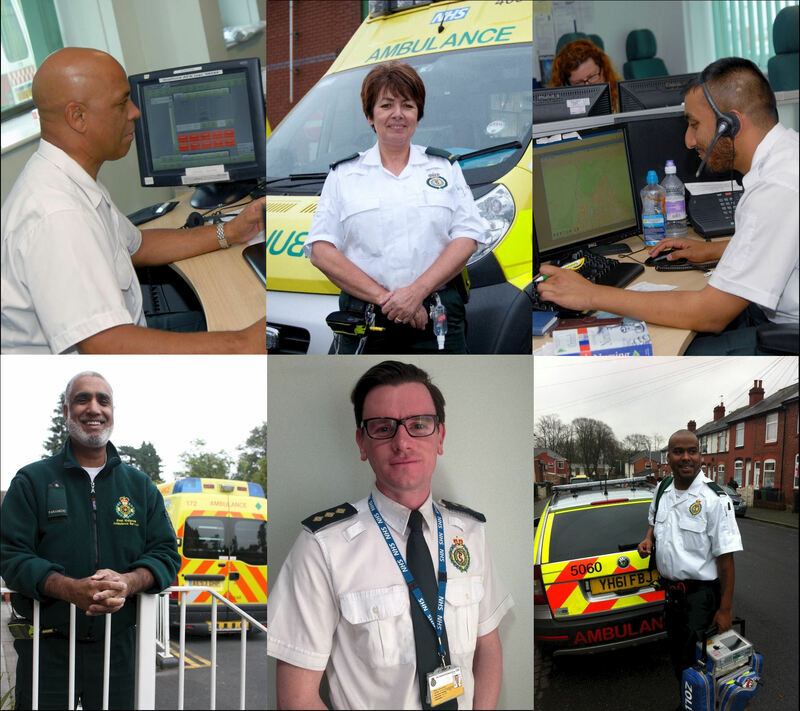 West Midlands Ambulance Service NHS Foundation Trust will be holding the AGM and Annual Members’ meeting from 6.00pm on Wednesday 17th September 2014, in the Conference Room, West Midlands Fire Service Headquarters, 99 Vauxhall Road, Birmingham B7 4HW. “However, the year was not without its challenges. We saw another increase in demand which meant we were busier than ever before. We narrowly missed our Red 2 performance target (by an average of 12 seconds per call) for the first time in six years. This was particularly disappointing given how hard our staff worked during the year. “The pressures that our staff now work under is greater than at any previous time I have known. To their immense credit, they continue to operate to the highest standards and give everything in order to improve the quality of care for patients. I would therefore like to take this opportunity to record my gratitude to them all as well as the hundreds of volunteers who help us every single day of the year. 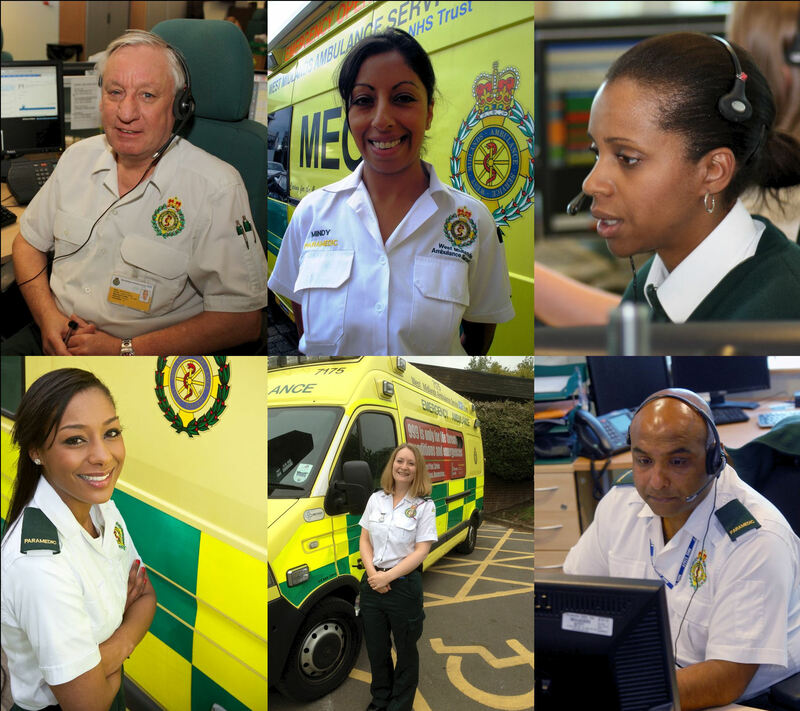 WMAS Chairman, Sir Graham Meldrum, added: “The high quality clinical care that is given to our patients on a daily basis remains exceptional and I wish to thank all of our staff and volunteers for their dedication and hard work. All members of the Trust are welcome to attend the AGM, as well as stakeholders and any interested members of the public. The meeting will include a presentation of the Trust’s activities over the past year and present the Trust’s Annual Report 2013-14, including Quality Accounts and financial statements which will be available on the Trust’s website following the meeting. The meeting is open to the public. Anyone wishing to attend should email: kay.cullen@wmas.nhs.uk to reserve a seat as space at the venue is limited. Tuesday 9th September 2014 – 6.32am – Murray MacGregor. Two middle aged men have been treated for smoke inhalation by ambulance staff after a kitchen fire at flat in Coventry. The fire broke out in the maisonette in the Sewell Highway at shortly before 12.50am. Unfortunately, the smoke from the blaze affected both of the occupants. Ambulance staff treated them at the scene before they were taken to University Hospital Coventry & Warwickshire by ambualnce. One man was in a more serious condition. Monday 8th September 2014 – 10.46pm – Murray MacGregor. 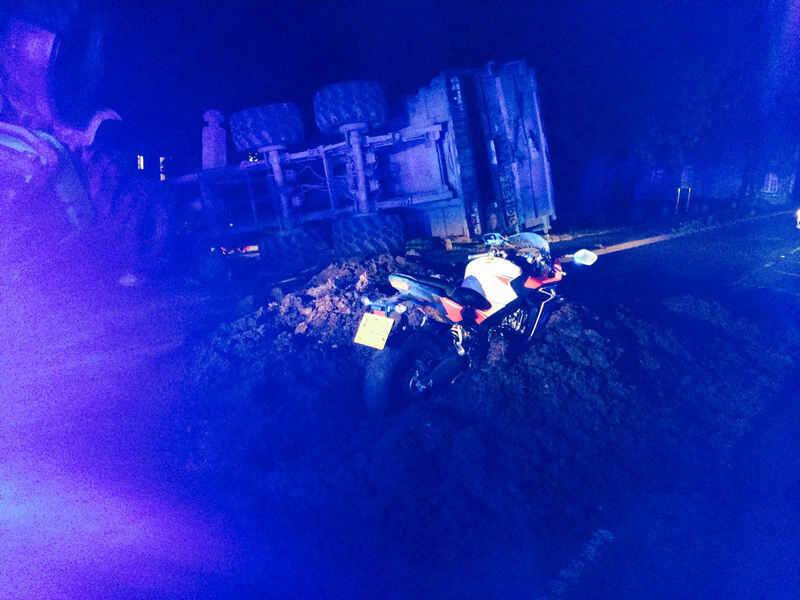 A motorcyclist had a soft, if smelly, landing after running into a spilt load of slurry. 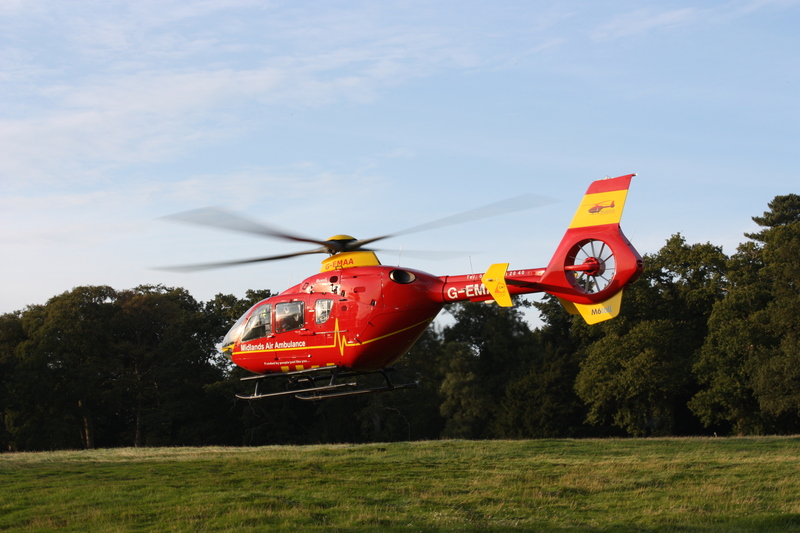 The unfortunate incident happened in Newbold On Stour in Warwickshire on Tuesday evening. West Midlands Ambulance Service was called to Stratford Road, next to the war memorial at 8.15pm. An ambulance, a rapid response vehicle and a paramedic officer were sent to the scene. 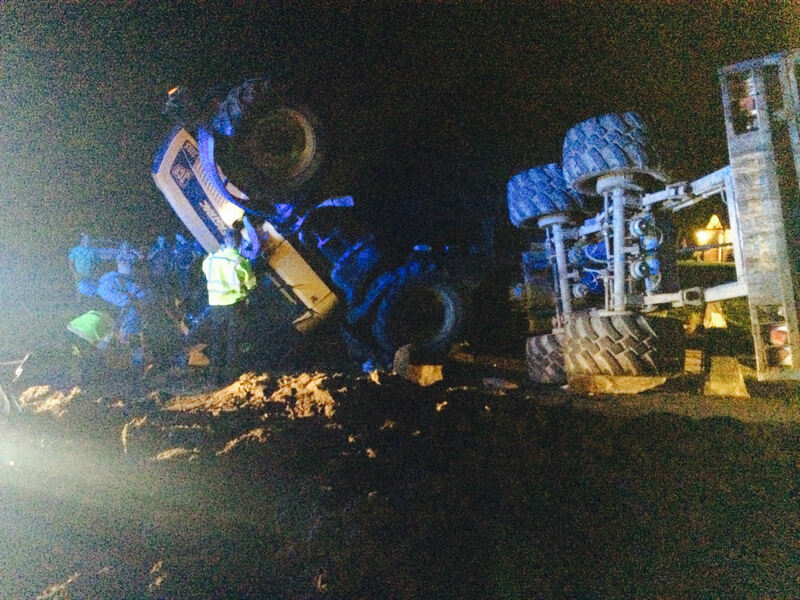 A West Midlands Ambulance Service spokesman said: “On arrival, ambulance staff found a tractor which had been pulling a trailer of slurry had overturned. The tractor was on its roof and the trailer was on its side with the contents over the road. “The crews were told that the rider of the motorbike had tried to stop but ended up riding into the slurry. His bike was still upright but he had apparently gone over the handlebars into the slurry. “The tractor driver had to be helped free by ambulance staff and firefighters. The 30 year old man had a minor head laceration but was also complaining of neck and back pain. As a precaution he was immobilised using a neck collar and spinal board before being taken by ambulance to Warwick Hospital. Monday 8th September 2014 – 21.30pm – Steve Parry. A motorist has been taken to hospital after his car collided with a tree near Redditch earlier today. West Midlands Ambulance Service was called to the junction of the A448 and the A441 at just after 9.30am. An ambulance together with a paramedic officer, a paramedic in a rapid response car and the Midlands Air Ambulance from Strensham attended the scene. A West Midlands Ambulance Service spokesman said: “Crews treated a man in his twenties after his car left the road and collided with a tree. “The patient was treated for serious back injuries. He had also sustained facial lacerations and abdominal pain. He was given pain relief by a doctor at the scene and fully immobilised before being taken to hospital. “The patient was airlifted to the Queen Elizabeth Hospital for further assessment and treatment. Sunday 7th September 2014 – 8.50pm – Suzie Wheaton. A motorcyclist has been airlifted to a major trauma centre after sustaining multiple injuries this afternoon. An ambulance, a paramedic area support officer and the Midlands Air Ambulance from Staffordshire attended the incident on Cannock Road in Penkridge shortly after 2.40pm. A West Midlands Ambulance Service spokeswoman said: “Ambulance crews were called to reports of a motorcyclist who had fallen from his bike. “The motorcyclist had suffered serious multiple injuries to his shoulder, chest and head. He was treated at the scene for his injuries, given pain relief and fully immobilised before being airlifted to the major trauma centre at University Hospital of North Staffordshire. Sunday 7th September 2014 – 8.30pm – Suzie Wheaton. 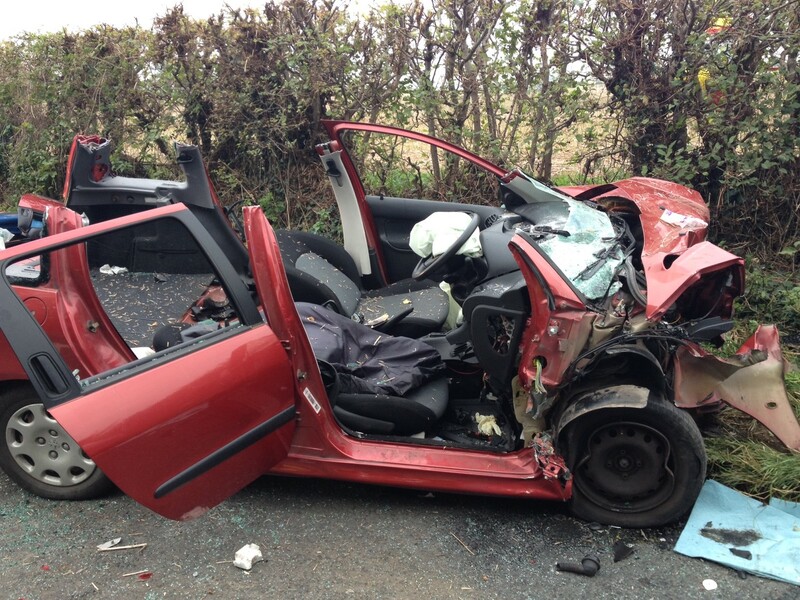 A man had to be cut free from his car following a road traffic collision in Wolverhampton today. West Midlands Ambulance Service dispatched two ambulances, a paramedic area support officer and the Midlands Air Ambulance from Cosford, carrying a trauma doctor and a critical care paramedic, to the incident on Codsall Road at approximately 2pm this afternoon. A West Midlands Ambulance Service spokeswoman said: “On arrival at the scene crews found two cars that had been in collision. One of the vehicles had sustained extensive damage to the front leaving its driver trapped by his legs. The driver, a man in his mid-20’s, was extricated from the vehicle, with the assistance of the fire service, and was treated for serious injuries to both of his legs. The casualty was given pain relief at the scene and fully immobilised before being airlifted to the major trauma centre at Queen Elizabeth Hospital Birmingham. Sunday 7th September 2014 – 7.50pm – Suzie Wheaton. 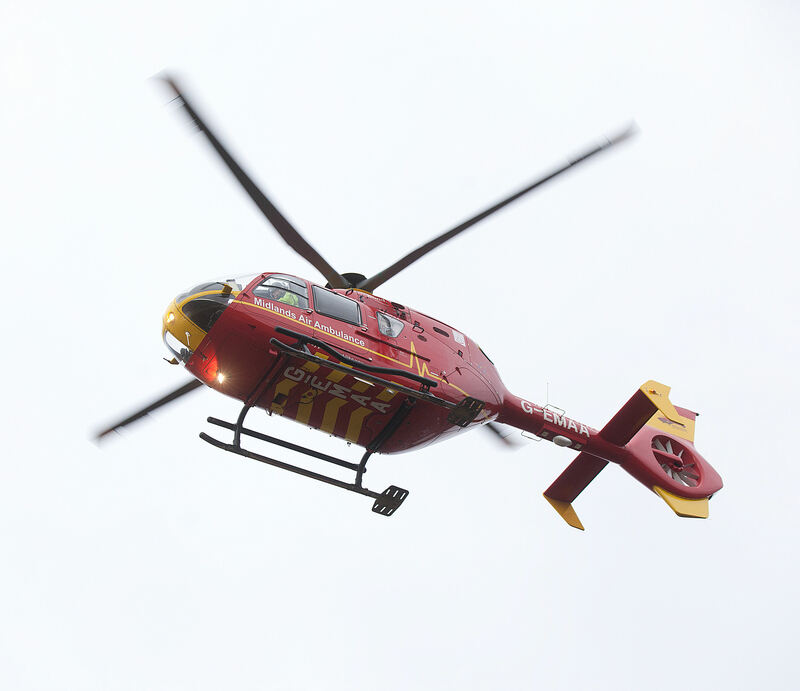 A woman was airlifted from the scene of a road traffic collision this morning. West Midlands Ambulance Service was called to reports of two cars that had collided on the A46 in Old Stratford and Drayton shortly before 10.55am today. An ambulance, a paramedic area support officer and Warwickshire and Northamptonshire Air Ambulance were sent to the scene. A West Midlands Ambulance Service spokeswoman said: “Crews arrived to find two cars that had been in collision. 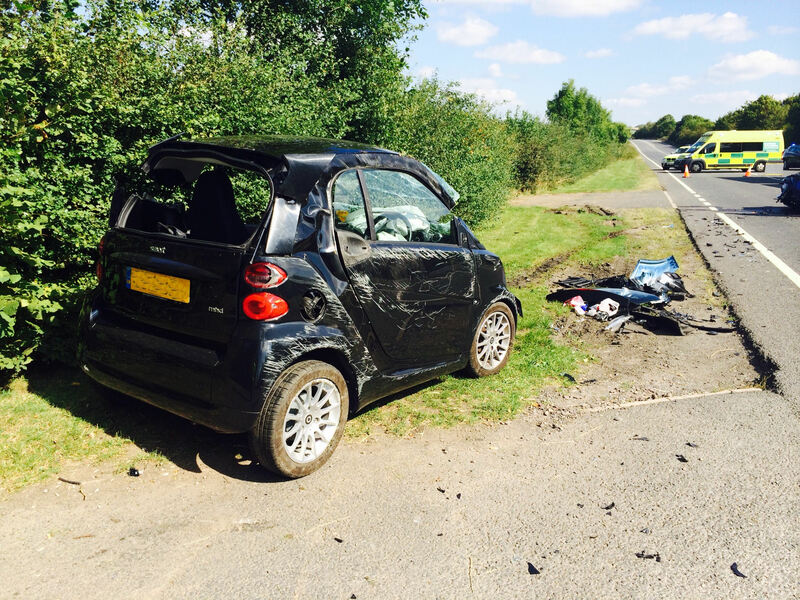 “The driver of one of the cars (Smart car) had sustained a head injury and neck and back pain. The woman in her 20’s was immobilised and extricated from the vehicle, with the assistance of the fire service, before being airlifted to Queen Elizabeth Hospital in Birmingham. “The hospital was pre-alerted to the woman’s condition and medics were on standby awaiting the crew’s arrival. Sunday 7th September 2014 – 10.30am – Suzie Wheaton. 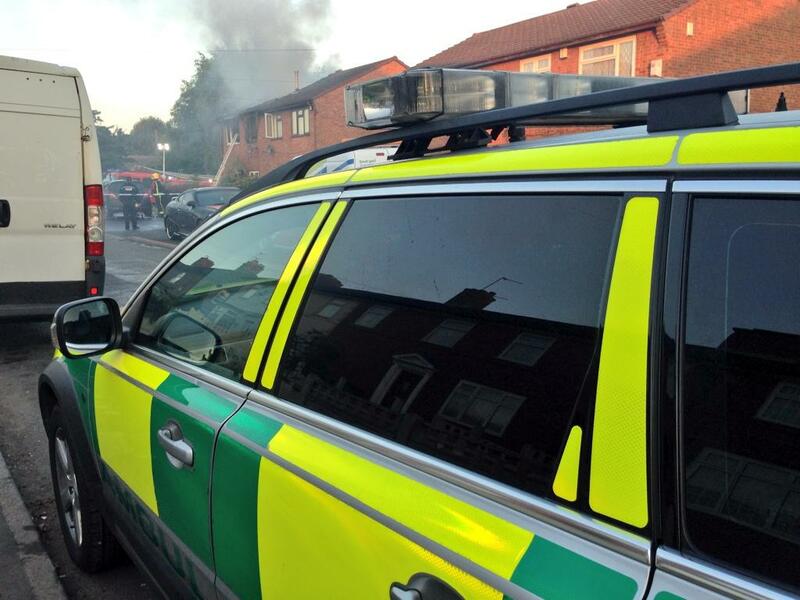 West Midlands Ambulance Service received reports of a house fire on Rusking Street in West Bromwich at approximately 5.10am this morning. Two ambulances, a rapid response vehicle, a paramedic area support officer and the Hazardous Area Response Team were dispatched to the scene where firefighters were tackling the blaze. A West Midlands Ambulance Service spokeswoman said: “On arrival at the scene crews found five people who were out of the property. Sunday 7th September 2014 – 9.30am – Suzie Wheaton. Four men have received emergency treatment from ambulance crews following a road traffic collision in the early hours of this morning. West Midlands Ambulance Service was called to Kielder Rise in Worcester at approximately 4.20am today. Three ambulances, a rapid response vehicle, a paramedic area support officer and the Trust’s MERIT rapid response vehicle, carrying a critical care paramedic and a trauma doctor, attended the scene. A West Midlands Ambulance Service spokeswoman said: “Crews arrived on scene to find a single vehicle that is believed to have been in collision with a telegraph pole and a wall. “The car had been carrying five men in their late teens to early twenties at the time of the incident. “Four of the occupants were out of the vehicle on the crew’s arrival with one man found in the car in a semi-conscious state. 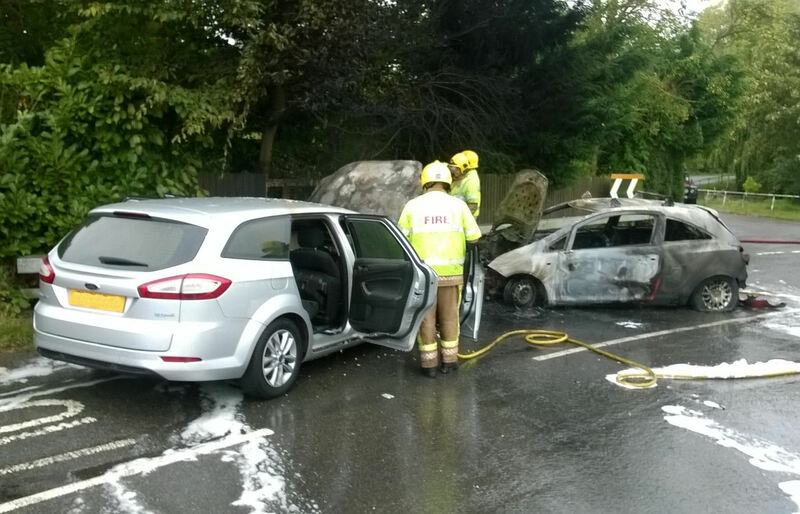 “The man in the car was immobilised and extricated from the vehicle, with the assistance of the fire service. The casualty was treated for chest, back and shoulder injuries before being conveyed to hospital. “A second man was treated for a head injury at the scene. He was also immobilised and taken to hospital for further assessment and treatment. “Two others were walking wounded and were treated for minor injuries before being conveyed in a third ambulance to hospital. “All four casualties were conveyed to Worcester Royal Hospital. Saturday 6th September 2014 – 11.00pm – Suzie Wheaton. A cyclist has been airlifted to hospital following an incident in Tanworth in Arden this evening. West Midlands Ambulance Service was called to reports of a cyclist who had fallen from his bike on Poolhead Lane at approximately 6.30pm. Two rapid response vehicles, an ambulance, a paramedic area support officer, the Trust’s MERIT rapid response vehicle, carrying a trauma doctor and a critical care paramedic and the Midlands Air Ambulance from Staffordshire were dispatched to the scene. A BASICS doctor was also in attendance. A West Midlands Ambulance Service spokeswoman said: “Crews were called to reports of a cyclist who had become injured after falling from his bike. “On arrival at the scene crews found the cyclist, a man, lying in the road. The man, who wasn’t wearing a cycle helmet, was found to have sustained serious head and chest injuries and a potential fractured collar bone. “Due to the serious nature of his injuries, the trauma doctor gave the cyclist an anaesthetic at the scene. The patient was fully immobilised and taken to the air ambulance, which had landed on a nearby golf course. The man was airlifted to the major trauma centre at University Hospital of Coventry and Warwickshire for further and treatment. Saturday 6th September 2014 – 8.25pm – Suzie Wheaton. 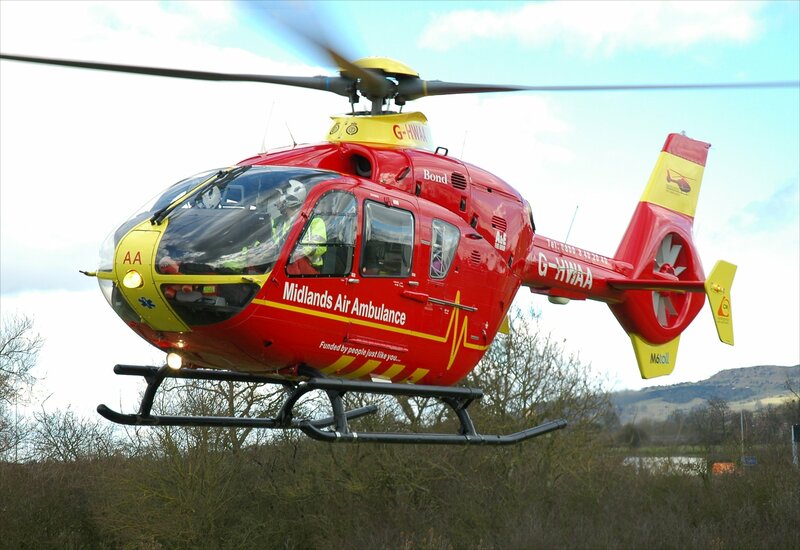 A man has been airlifted to hospital following an incident in the Black Country this afternoon. Two ambulances, a paramedic area support officer and the Midlands Air Ambulance from Cosford were dispatched to the incident on Hawbush Road in Bloxwich, Walsall shortly before 5.25pm today. 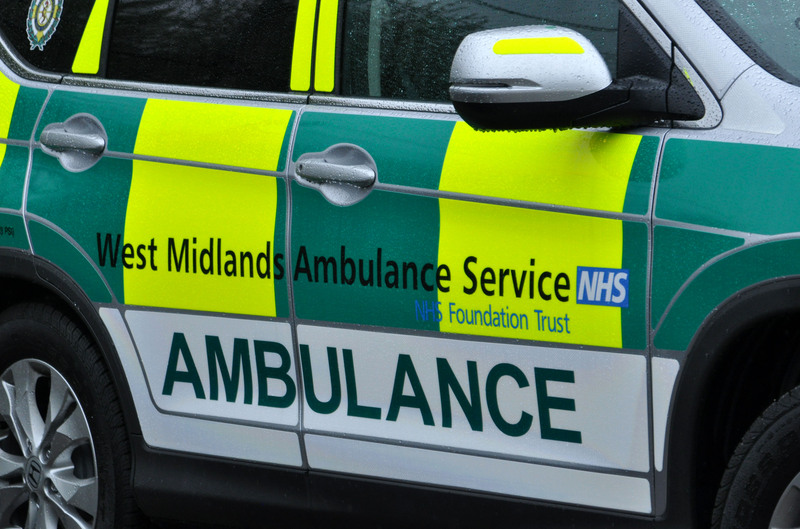 A West Midlands Ambulance Service spokeswoman said: “Ambulance crews were called to reports of a man who had become injured after falling from a quad bike. Saturday 6th September 2014 – 8.15pm – Suzie Wheaton. A motorcyclist has received emergency medical treatment from ambulance crews following an incident this morning. West Midlands Ambulance Service received a call to the junction of Stafford Road and Bell Lane in Bloxwich, Walsall at approximately 11.25am today. An ambulance, a paramedic area support officer and the Midlands Air Ambulance from Cosford, carrying a trauma doctor and a critical care paramedic, were dispatched to the scene. A West Midlands Ambulance Service spokeswoman said: “Crews arrived on scene to find a motorcyclist lying in the road. Friday 5th September 2014 – 4.45pm – Steve Parry. A man was trapped for almost an hour after he was ejected from his car and trapped between the front wheel of his vehicle and the kerbside. West Midlands Ambulance Service was called to reports of the incident at Barr Beacon car park near Walsall, at just before 3pm. An ambulance; a paramedic in a rapid response car; a community paramedic and the Midlands Air Ambulance from Cosford were dispatched to the scene. A West Midlands Ambulance Service spokesman said: “Crews were called to a single vehicle incident on Barr Beacon car park. “The driver, believed to be in his eighties, appears to have been ejected from his car and was found trapped between the front wheel and kerbside. “Medics treated the patient for serious head, arm and back injuries. A woman has died and a man seriously injured following a road traffic collision near Canon Pyon in Herefordshire, this afternoon. West Midlands Ambulance Service was called to the A4110 at just after 1pm. Two ambulances, a paramedic officer in a rapid response vehicle and two air ambulances’ were sent to the scene. A West Midlands Ambulance Service spokesman said: “Crews responded to a road traffic collision involving a car and lorry near Canon Pyon. “A woman passenger travelling in the car was treated for her injuries. Sadly, despite the efforts of medics the patient was confirmed dead at the scene. “The male driver of the car involved, believed to be in his eighties, was extricated from the vehicle. He was treated for leg, chest and arm injuries and airlifted to the Queen Elizabeth Hospital for further assessment and treatment. Thursday 4th September 2014 – 2.00pm – Suzie Wheaton. 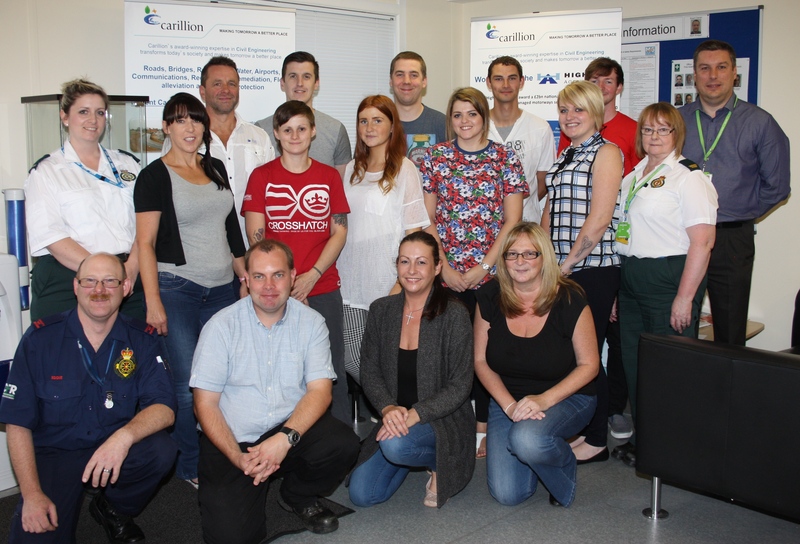 Thirteen brand new volunteer lifesavers have successfully passed their assessments and are ready to respond to medical emergencies in their local community. Community First Responders (CFRs) are member of the public from all walks of life with this cohort of students being no different with a restaurant manager, carers, lifeguards and business sales personnel all giving up their time to help make a difference. CFRs are groups of volunteers that respond to emergencies on behalf of West Midlands Ambulance Service, prior to the arrival of an ambulance. All CFRs are trained by the Ambulance Service to a nationally recognised level and help to reach those people suffering from medical emergencies in the remote rural communities fast. In many illnesses or injuries the first few minutes are critical and simple interventions can be performed in order to save lives or prevent disability. The thirteen pupils recently undertook the First Person on Scene Intermediate course over a period of seven days at the Carillion depot in Cannock. The week long course finished on Thursday 28th August after the pupils completed their final assessments which included a written examination followed by a basic life support practical test. The CFRs now have to complete a number of observational shifts with ambulances crews before they are able to respond solo within their communities, which will include Burntwood and District, Hednesford, Stone, Gnosal and Featherstone. Prior to this latest cohort of student there were 263 CFRs within Staffordshire; some work alone as an individual, whilst others may belong to one of the 32 groups currently operating within the County. Victoria Tufail, WMAS Community Response Manager said: “West Midlands Ambulance Service prides itself on having excellent community schemes that are in place around the region. CFRs are vital in rural communities and it is without doubt that thanks to their efforts, dedication and actions, lives have been saved. “Eighty-five percent people who suffer cardiac arrests have the ability to be corrected by defibrillation. The quicker someone is defibrillated, not only improves the chance of their survival but it can also help to improve the chances of a full recovery and the time it takes to do so. For every minute a patient is in cardiac arrest, their chance of survival decreases by 10 percent. Thursday 4th September 2014 – 11.15am – Claire Brown. 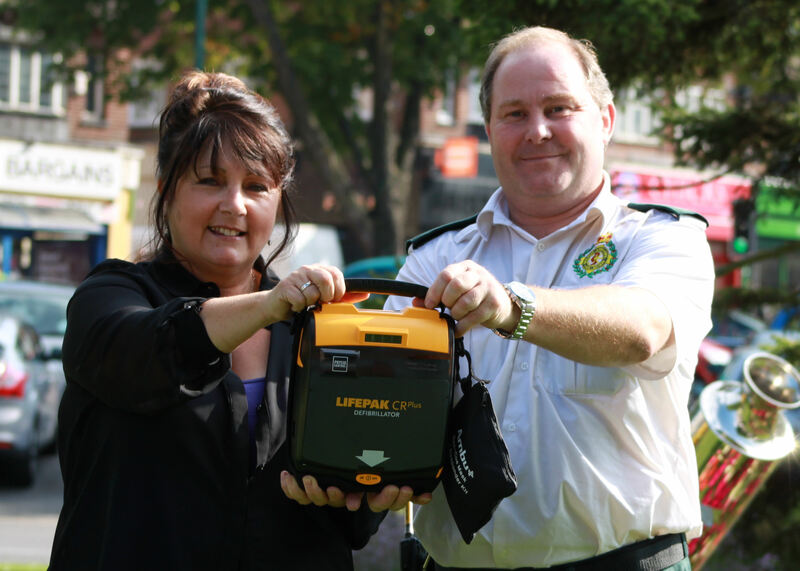 Wherever you are in Acocks Green Village, you’re never too far away from a device that could save your life. 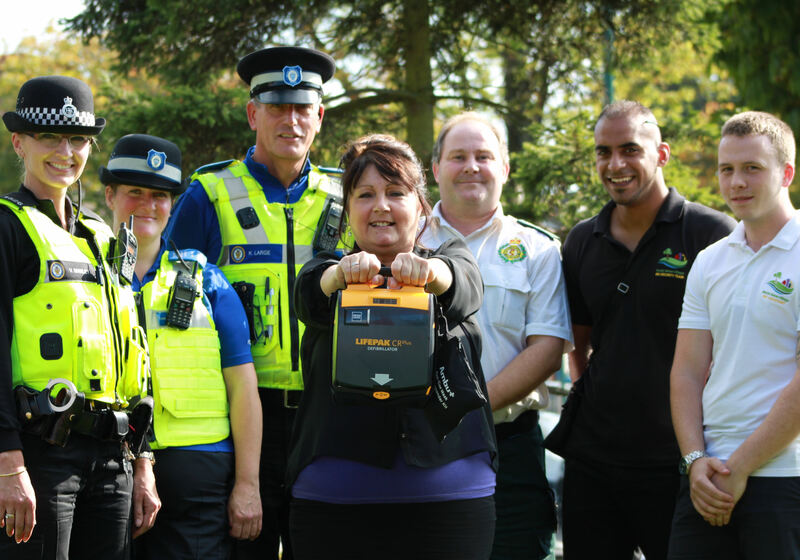 Acocks Green Village BID (Business Improvement District) recently installed two automated external defibrillators (AEDs); a device used to restart the heart of a patient in cardiac arrest. One device was purchased by the BID through fundraising whilst the second placement has been supported by West Midlands Ambulance Service. Both are situated in shops either end of the village, one in Dazzle and one in Costa. Sandy Gianni, BID Manager, said: “We’re really proud to have these in our village and I think every town should have them. What’s been brilliant is that everyone has got behind the initiative and helped to contribute to the purchase of the defibrillator. “Not only have all of the local businesses contributed collectively via the BID levy, but our local Sainsbury’s gave a large donation and members of the public were also very generous at the BID’s community fundraising events. Local Councillors also successfully approved a bid to provide further funding from the Acocks Green Community Chest which we’re also grateful for. Acocks Green Village Business Improvement District (BID) is an independent business led and not for profit company which is paid for by all of the Village businesses, collectively, via an annual levy. Pictured (left to right): PC Vicky Manley, PCSO Amanda Conlon, PCSO Kevin Large, BID Manager Sandy Gianni, WMAS Community Response Manager Andy Jeynes, Security Guard Shahir Ahmed and BID Assistant Daniel O’Neill. Wednesday 3rd September 2014 – 1.30pm – Chris Kowalik. 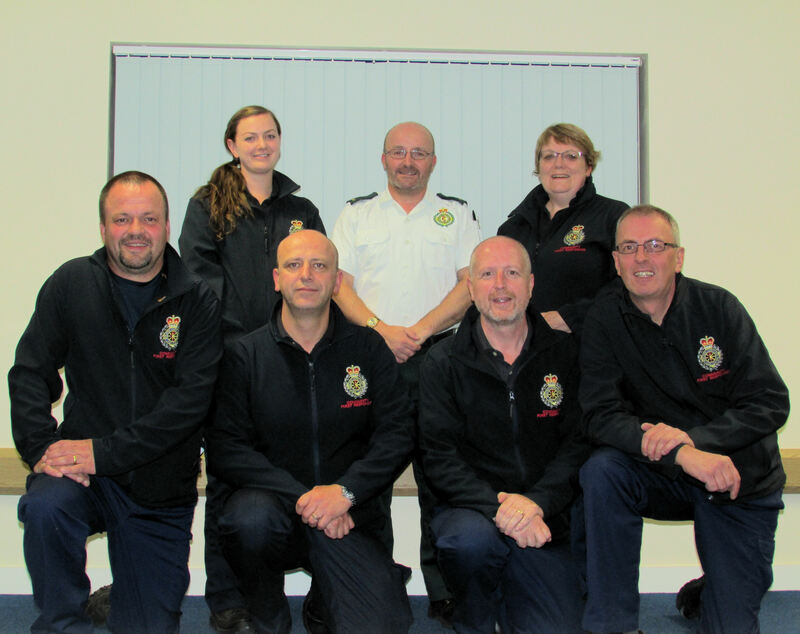 An appeal has been made for Community First Responders (CFRs) in Herefordshire. Volunteers are particularly needed in and around Ledbury, Ross-on-Wye and Kington. Community Response Manager Noel Orbell said: “Volunteers come from all walks of life. When they make themselves available to respond they can continue to go about their daily lives, but if an emergency call is received by the ambulance service within a five or six mile radius, they are sent and always backed-up by an emergency ambulance service vehicle. “Applicants will attend a nationally recognised training course covering Basic Life Support and Defibrillation, Medical Emergencies, Traumatic Emergencies and Preparing for Active Duty. They will then train alongside ambulance crews before going ‘live’”. Wednesday 3rd September 2014 – 8.30am – Suzie Wheaton. 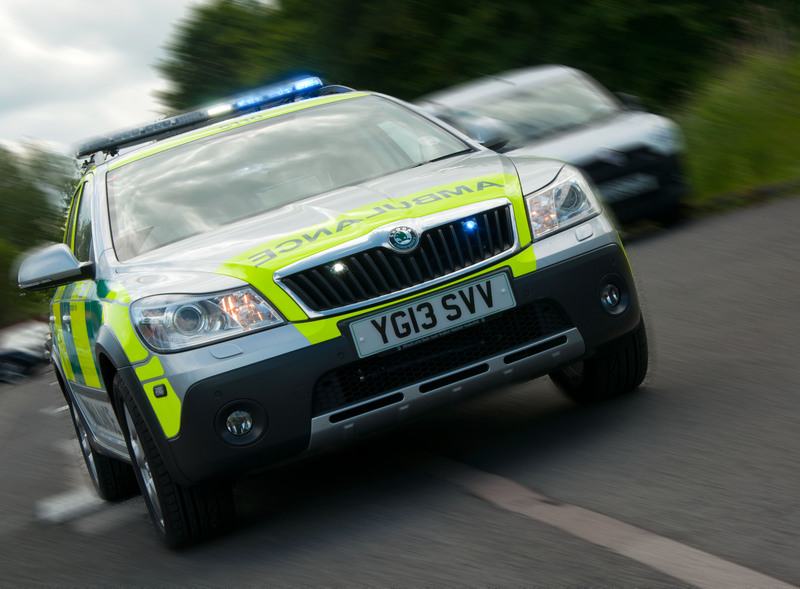 A pedestrian has suffered multiple injuries after being in collision with a car in Staffordshire yesterday. Ambulance crews were called to the collision on Glascote Road in Tamworth shortly after 8.55pm last night. An ambulance, a rapid response vehicle, a paramedic area support officer and the Trust’s MERIT rapid response vehicle, carrying a critical care paramedic and a trauma doctor attended the scene. A West Midlands Ambulance Service spokeswoman said: “Crews arrived to find a pedestrian and a car that had been in collision. The pedestrian, a man in his 60’s, was treated for multiple injuries to his head, collar bone and hip. Wednesday 2nd September 2014 – 8.00am – Suzie Wheaton. 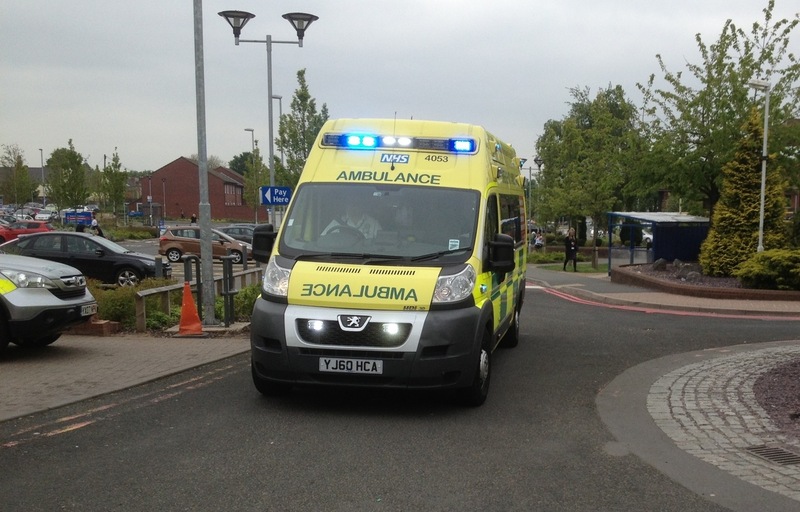 A motorcyclist received emergency medical treated following an incident in Birmingham yesterday. West Midlands Ambulance Service dispatched an ambulance, a paramedic area support officer, a rapid response vehicle and the Trust’s MERIT rapid response vehicle, carrying a critical care paramedic and a trauma doctor, to the incident on Gressell Lane in Kitts Green shortly after 7.55pm last night. A West Midlands Ambulance Service spokeswoman said: “Crews were called to reports of a motorcyclist who had come off his bike and was found on a driveway. “It is believed that the motorcyclist had been in collision with a hedge and a stationary car before coming off the bike. Tuesday 2nd September 2014 – 11.00pm – Suzie Wheaton. A pedestrian was treated for serious leg injuries after colliding with a car in Coventry this evening. The collision took place at the junction of Foleshill Road and Edmund Road in Foleshill, Coventry shortly after 8.00pm today. An ambulance and a paramedic area support officer were dispatched to the scene. The police were also in attendance. A West Midlands Ambulance Service spokeswoman said: “Crews were called to reports of a pedestrian and a taxi that had been in collision. “The pedestrian, an 18 year old man, was found to have sustained significant lower left leg injuries. Due to the serious nature of the injuries, ambulance crews gave the man pain relief before having to reposition his ankle and foot back into the right place. The man was fully immobilised using a neck collar and spinal board and his leg immobilised in a vacuum splint. Tuesday 2nd September 2014 – 7.25pm – Murray MacGregor. A motorcyclist has escaped serious injury after landing on a grass verge after a collision with a car in Herefordshire. The collision happened at about 4.10pm on Tuesday afternoon at the junction of the A4112 and the road to the Kinnersley Arms. An ambulance initially responded but the crew requested a helicopter and the Midlands Air Ambulance from Stensham was also dispatched. A West Midlands Ambulance Service spokesman said: “On arrival, ambulance staff found the rider, a man who was about 30 and from the Leominster area, lying on a grass verge. “The bike had front end damage while the car had damage to the right hand side. “The main concern for the rider was a head injury as he was not fully conscious. He also had facial and leg injuries. 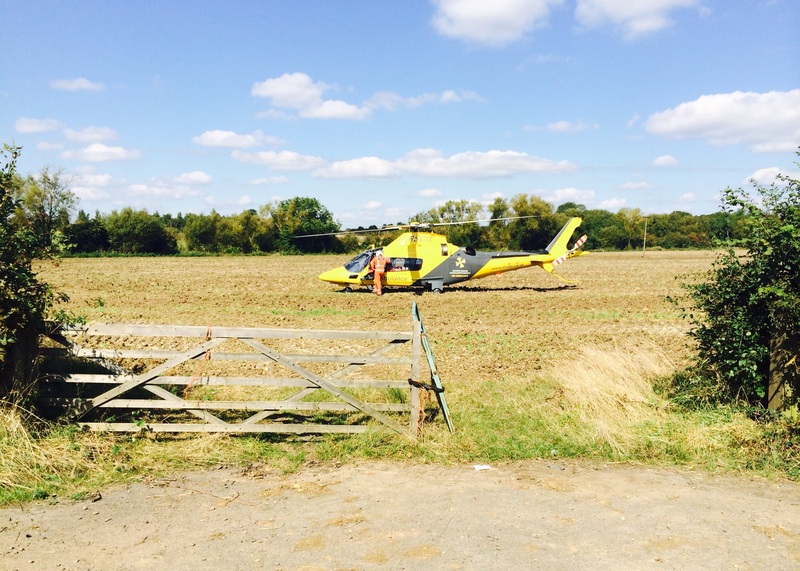 “After a full assessment at the scene, the crews decided to convey the rider to Hereford County Hospital. “His level of injury was undoubtedly less serious due to where he had landed.